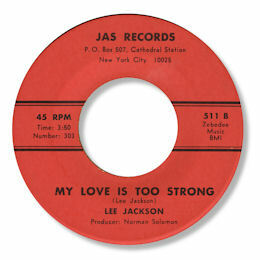 Like his stablemate Mr D, Lee Jackson had two 45s on the New York Jas label, one well known and celebrated the other much more obscure. But his first release was for Atlantic. Ad For Love is a splendid deep soul song, well crafted and sung with considerable skill by Jackson, whose adlibbing towards the conclusion is the icing on the cake. Love the doo wopping style girl background singers too. Jackson's first 45 for Jas is the more difficult one to find. But My Love For Is Too Strong is well worth the hunt. This is Big Apple soul at it's best - wonderful church organ, lovely syncopated piano, tasteful guitar - and on top of all this a really tough vocal. Here Lee really sings like his life depends on it - swooping and soaring through the fine chord changes. Life Ain't Easy might well have been cut at the same session so similar is the "feel" but it has the virtue of some strong horns added to the mix. Once again Lee is a really convincing vocalist on this tasty ballad. Uptempo flip is pretty good too. 1. 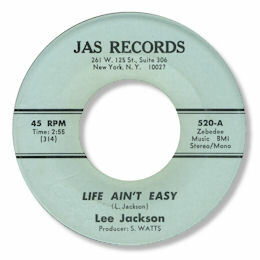 The Chicago based blues singer Lee Jackson who cut for CJ, Cobra and Bluesway is a different artist. But advenrurous redaers should certainly check out his excellent "Fishin' In My Pond". 2. 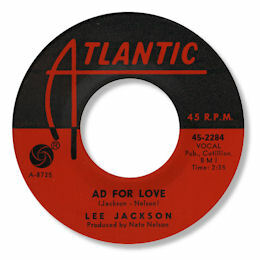 The stereo version of "Ad For Love" on the Ace UK "Sanctified Soul" CD is different from the Atlantic 45.